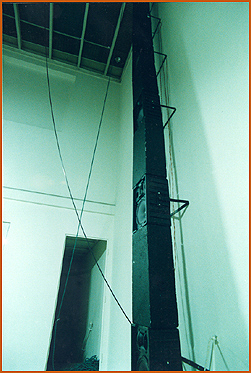 The sound installation of the room “lost” is characterized above all by the angle formed by the loudspeakers (level A). This column, which is prolonged on the floor, represents the most important component of the installation in the inner court. Along this path, masses of sound crash down and, in certain phases, reascend the column. 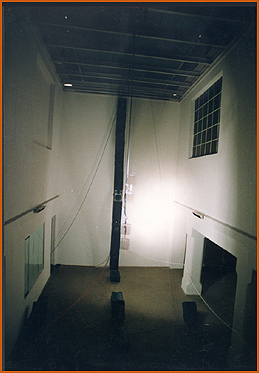 In the room, the visitor is sometimes surrounded by a sound band moving along a semicycle formed by loudspeakers (level B) counterpointing the downcrashing sounds. Just as in the room “sound warp”, a separate stereo set is installed which transmits the sound tableau for the threedimensionally moved sounds of levels A and B. How can sound be exhibited? The question itself already contains the contradiction between different forms of art. An exhibition is experienced by a visitor as a spatial sequence – this is the convention of art exhibition. Sounds, on the other hand, are experienced by static listeners as a temporal sequence – this is the convention of the musical performance. To the visitor of an art show, a subjective experience set in time is developing through his movement in space; a listener to a concert develops an objective structure of time. Any attempt to avoid these conventions has to deal with the persistence of these established ways of experiencing culture. The project “TopoPhonicZones” of Sabine Schäfer starts at exactly this point and shows in four consecutive rooms four modes of combining acoustical, optical and physical forms of perception. It all starts with a sound tunnel – a linear route the visitor covers in space, bringing about a passage of sounds through subjective movement. In the next, large room, things become more complex: the “sound warp” circles above the visitor – other individual sounds can only be perceived in passing by, requiring a closer approach to the loudspeaker, as if sound were an object you want to get a closer look at. The listener finds himself eavesdropping time and time again, swaying in attention between the total and the detail. The “Fruits of Columbus” of Hens Breet play with the same spatial ambivalence – from afar, in projection, there is a magical shining – from close by nothing but potatoes. In the next room, the composition “Lines Between” requires a more prolonged attendance of the visitor, as the piece is, all in all, more than twenty minutes long. The visitor is even offered a chair so that he may follow up the sounds moving around him. In the same way as the composition in this room approaches conventional, linear forms of music, the wall reliefs of Werner Cee stay within the frame of classical visual art, resulting in a contrast of static imagery and mobile sound. Totally different things happen in the last room: “Lost” melts intense optical and acoustical impulses into a short but violent impression. The visitor will neither sit down nor move about – he is standing upon a stage towering up in the room – “thunderstruck” – as if he were looking down from a balcony upon the spectacle of nature. Every single room of the four “TopoPhonicZones” is a model for a possible form of interdisciplinary art. Every room has a its very own atmosphere and places the visitor in a very special position towards the artwork. Many metaphores come into mind: the four seasons, the four elements, the four winds of heaven. 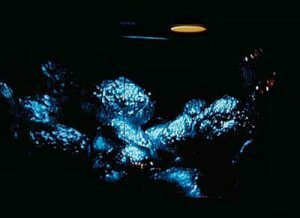 However, none of them are accurate – although still all four modes of experience are abstractions of natural processes, playing with the transitions from hot to cold, solid to liquid, far away to close by, but without ever becoming nothing but simple allegories. The installation “TopoPhonicZones” in the Badischer Kunstverein Karlsruhe relates exactly to the existing architecture – every room displays a subtle modification of its own architectural structure. This not only is the strong point of the project – it also shows the effort interdisciplinary work requires: years of preparation are needed to organize an event which lasts only five days. A project of this kind cannot be transported from one museum to another, or from one concert hall to the next – it has a quality that has become very rare in the business of culture: it is an event conceived expressly for a specific place at a specific time. Wie stellt man einen Klang aus ? Die Frage enthält bereits den Widerspruch zwischen verschiedenen Kunstformen. Eine Ausstellung wird als räumliche Folge von einem Besucher erlebt – dies ist die Konvention der Kunstausstellung. Ein Klang wird als zeitliche Abfolge von statischen Zuhörern erlebt – dies ist die Konvention der Musikaufführung. 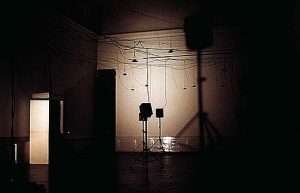 Für den Besucher einer Ausstellung entwicklet sich ein subjektives, von ihm selbst steuerbares Zeiterleben in der Bewegung durch den Raum – für den Zuhörer eines Konzerts entwickelt sich eine objektive Struktur von Zeit. Jeder Versuch, diesen Konventionen zu entkommen, muss sich mit der Hartnäckigkeit dieser festgeschrieben Erlebnisweisen von Kultur auseinandersetzen. Dieter Daniels, born 1957. One of the founding members of the Videonale, Bonn. Since 1991, he has compilated the video collection of the center of art and video technology, Karlsruhe (ZKM). Since 1993, professor for history of arts and media theory ot the Institute for Print and Graphic Design. One of the most important aspects of hearing is the localization of the source of a particular sound. This is achieved with such precision that a listener is able to understand what is being said even when he is surrounded by a crowd, as the precise localization of the sounds of speech makes it possible for him to assemble these individual sounds into a logical sentence. In music, the capacity of the ear to perceive space has been of varying importance through the years. It played an important role in the early days of polyphonic instrumental music. In multi-choral works, the different positions in space attributed to the individual choirs clearly emphasized the musical form. However, composers gradually lost interest in the concept of spatiality. Musicians, facing the audience from high upon the stage, were merely supposed to open up new emotional spaces.far beyond reality. In the nineteenth century, composers occasionally remembered that remote, “lointain” sounds, can produce in the listener a certain consciousness of the physical world around him. The range of musical material would, however, be restricted to variations in pitch, duration and volume of sounds of apparently undefined origin. In the twentieth century, the idea of composing space by means of music was revived, and at the end of this century the innovative aesthetic potential of this compository technique is steadily gaining support. Since the early days of modern music, composers like Schönberg, Hindemith and Varèse have been looking for new definitions of musical space, and musical theorists only started to follow these artists into so far unknown territory when it became evident that they were dealing with a new musical category which was of central importance to aesthetics. After World War II, two events promoted the interest in “Raummusik”: On the one hand, new technologies for reproducing sounds had been developed, encouraging new ways of dealing with the origin of sounds, in particular the position of the loudspeaker. And secondly, developments within musical thinking made composers expand musical structures into the surrounding space. In addition to the dimensions of sounds mentioned above (pitch, duration, volume), composers started to integrate the physical space in their artistic way of thinking. Often this meant a retreat from the traditional concert hall, which proved too static a place to offer a possibility to change the relation between the audience and the performed work. Many different forms of spatial compositions have been developed during the last fifty years, right up to the sound-installation as a totally new genre. This diversity is based on the multi-dimensionality of space, as well as on the complex relation between aural space, in which tones slide from high to low, and the physical space in which they resonate. Along with this, it has now become possible to integrate the acoustic phenomena of the physical world, such as speech and noise. The sound spaces created by Sabine Schäfer take an intermediate position between room compositions and installations. They mystify the room, although they are not merely modifications of the surrounding space. 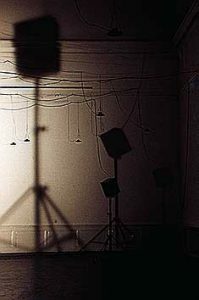 They render a three-dimensional reality to the sound event, not only by using distinct positions of the loudspeakers, but also by processing different gestures of movement. Tones may be static or they may travel across the room, displaying themselves as objects, a sensation normally only known from aural space. Like the individual instrumental parts in a polyphonic piece, sounds are used to constitute different levels in the physical room, where movements can be conceived as counterpoints like lines flowing in loops over resting tones. By moving through the room, the visitor craetes his or her own “floridus”. He or she may follow the stream of sound or identify with a certain location inside the stream. As the material of the individual layers changes occasionally, he or she may wonder about the semantics of a certain text fragment processed like minimal music. Somewhere we hear the voice of Woody Allen: “I find it hard to tell reality and fantasy apart”. And as this new acoustic world, accompanied by light, becomes more and more unpredictable, we are overcome by the impression of being caught inside a film, a film in which music plays the leading role. 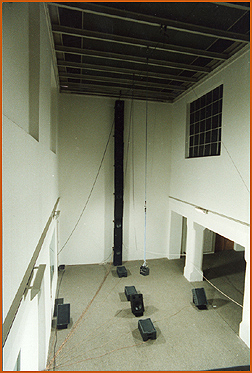 The TopoPhonicZones connect three rooms with different structures resembling the individual movements of some piece of orchestral music. Leaving a polyphonic event behind, the visitor next enters a more rhythmical room in which the sounding bodies rushing down have somehow taken over the massive apppearance of their movement. Once again, the streaming sound tape (here only mentioned as such) occasionally surrounds the visitor, providing a context in the same way the fundamental layer does in the memory of those who have already moved on. The third room dissolves the counterpoint into two opposite tonal surfaces, the overtonal fabric of which is enriched with iridescent flowing patterns. They seem to be situated far away from the noisy atmosphere of the two other rooms. Slowly shifting melodies are murmuring, offering colourful blends. To the visitor focusing his attention on the room, nothing seems to be static any more. In everyday life, the ear enables us to determine where we are by localizing sounds and estimating their distance. In these melodically woven, highly detailed tonal fields, however, one may feel able to follow the acoustic vibrations into a certain inner world, presupposing a three-dimensionally structured exterior, but no longer identical with it. This new topological definition of space in an audio-visual event calls for a new emphasis on hearing and seeing. It is based upon an extraordinary complex computer technology that visualizes the thinkable and refers to a possibility of changing the world. “But that’s none of your business!” Or is it? “The Universe is expanding…” These text fragments indicate that there is more to the TopoPhonicZones than an interesting afternoon in an art gallery. Dr. Helga de la Motte-Haber: born in Ludwigshafen, 1938. Studied psychology and musicology in Hamburg. 1971, habilitation for the field of systematic musicology. 1978, professorship at the Technische Universität Berlin. Numerous publications in the field of music psychology and musicology.